captured this image of lightning strikes in North Scottsdale. It was the one time Jacobo Insogna dared Mother Nature. Scottsdale. Rain started to fall, heightening the risk factor. traffic so he was able to position himself in the middle of the street. high velocity beauty can produce. Danger comes not only from rain but also from the lightning itself. “One time at Pinnacle Peak, the lightning shot sideways,” Mr. The beauty of northeast desert keeps the photographer coming back. as the 101, provide him with a bird’s eye view of the higher elevations. But it’s the lightning that really energizes him. “Sometimes the storms come in like a rocket,” Mr. Insogna said. horizontally across the sky, and in balls of fire. “The lightning hits the highest points,” he continued. The dedicated photog has two choices when a lightning storm is sighted. come to him. Or he can chase it. Sometimes he just sits back and admires the view. “I’ve watched a storm just walk down the mountains,” Mr.
precautions to protect his camera equipment-and his body-from harm. from the rain. And he stays close to his vehicle. “I’m always looking for something spectacular,” he said. spent many years photographing lightning over North Scottsdale and other Valley locations. He shared the following tips on how to capture the images on film. Watch the weather. Be prepared and ready to go if a storm is moving toward your area. with its four rubber tires, your car provides a safe zone. discouraged if you don’t get the shot you want. It took Mr.
Insogna two years to get the cover shot at WestWorld. around you. Take advantage of it. Use a tripod and shutter cable for timed shots. 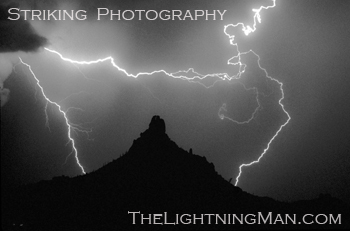 STRIKE ZONE – Lightning energizes nature photographer | The Lightning Man – Lightning Photography Images – just great!